The motor vehicle power of attorney is used by a vehicle owner to allow another person to handle certain responsibilities on their behalf, such as, registration, obtaining a certificate of title, or selling the vehicle. 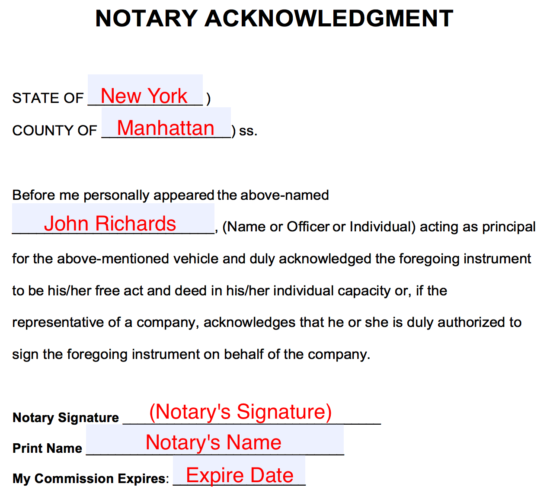 In most States, this form is required to be signed in the presence of a notary public in accordance with power of attorney laws in regards to property. Motor Vehicle Bill of Sale – If the power of attorney was created to sell a vehicle on the owner’s behalf, this State-specific document will be required to facilitate the transaction. 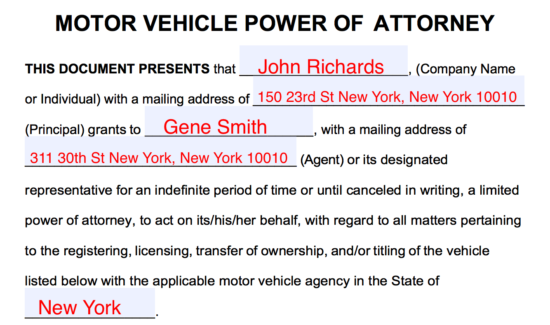 What is a Motor Vehicle Power of Attorney? What is a Vehicle Power of Attorney? Situations often occur when an owner of a vehicle (known as the “Principal”), which could be a company or an individual, needs the help of another person (known as the “Agent”) to handle vehicle-related tasks. You may choose whether to make your Motor Vehicle Power of Attorney specific or cover a broad range of purposes. You are unable to physically attend to the needs of your vehicle. Need an employee to file the appropriate paperwork/registration/title for a company vehicle. You need to appoint an attorney-in-fact to transfer title to a vehicle. Before completing a Motor Vehicle Power of Attorney, you need to obtain the vehicle’s information including the Year, Make, Model, Style, Vin Number and Odometer (Milage Count). This information will be inputted into your Motor Vehicle Power of Attorney. Once you have this basic information, you need to choose an attorney-in-fact who will be acting on your behalf in regards to your vehicle. Once your Motor Vehicle Power of Attorney is complete, it is necessary that the vehicle’s owner sign the document along with the signature of a Notary Public. Whether a vehicle needs to be titled, registered, purchased or sold, the owner can elect to choose someone else to handle these decisions through the use of a motor vehicle power of attorney form. The owner, known as the “Principal”, will be required to complete the form and sign in the presence of a notary public. any Other Documents that may be required by the local motor vehicle office. This information will be used to certify the owner and verify vehicle information. Select an individual or company to handle the owner’s requests. This should be someone that is trustworthy and can handle the responsibility that is given to them. If the powers are restricted, make sure to define the agent’s limitations. For example, if the agent is only allowed to register the vehicle make sure to write it in a clear manner. 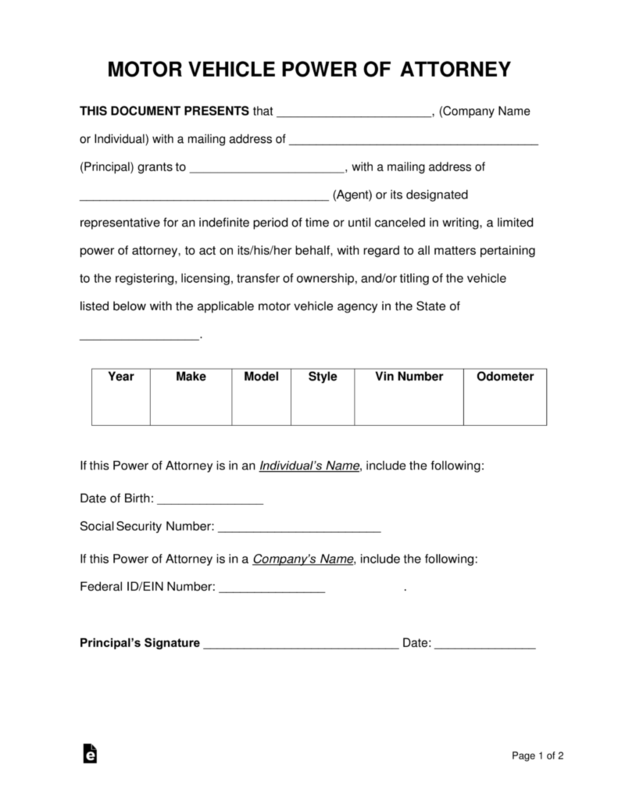 Many vehicle power of attorney forms are written to allow someone else to sell a vehicle, therefore, make sure to write the form specific to the owner’s needs. Vehicle Bill of Sale – Use as a purchase contract for a vehicle between a buyer and seller. After the form is notarized the agent will be able to begin acting on their newly acquired powers. 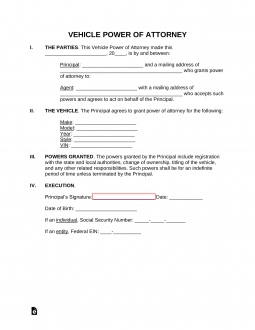 It is best to use the State specified vehicle power of attorney document when writing. If your State does not have a specific form, you may use the generic one provided and fill-in. In the first field, enter the name of the Principal (Vehicle Owner) including their mailing address. Follow by doing the same for the Agent (attorney-in-fact). To complete this step, input which State the vehicle is or will be registered. If the vehicle’s owner is an Individual, input the owner’s date of birth and their social security number. If the vehicle is owned by a Company, enter a federal ID/EIN number. In our example, the vehicle is owned by an individual.